Embrace your inner child with Hoop Yoga. A unique form of movement combining traditional yoga and the flow of hoop dance, Hoop Yoga is a great way to exercise and have a laugh. Gloria, who runs the class gives practical guidance on postures and hooping technique. Hoops are available to borrow during the lesson and have been custom made for adults to exercise and dance with. Hoop Yoga has many health benefits including; stress relief and letting go, core strength and toning, cardiovascular fitness, increased flexibility and a complete workout for the mind and body. Classes are held weekly every Saturday morning between 8 and 9am at Bondi Beach. 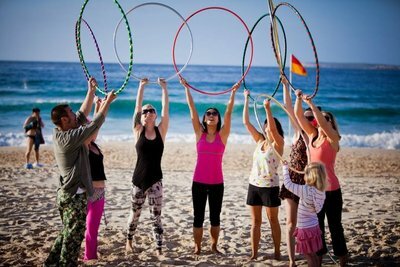 Also, Hoop Yoga hold regular workshops in different locations around Sydney. If you are interested in organising a Hoop Yoga session (they cover team building sessions, corporate days and parties) simply get in touch with Gloria via the website. Enjoy your spin and stretch. Where's the Best Car Wash in Sydney?